Argos is very well known to UK shoppers, providing their customers with non-stop toys, electronics, accessories, furniture and plenty more! So if Argos has a 3 for 2 on Toys in April 2019 you can imagine, it could become rather manic. During this event there’s all kinds of savings on toys including LEGO, Nerf, Paw Patrol, Shopkins and so much more for your little ones to enjoy! 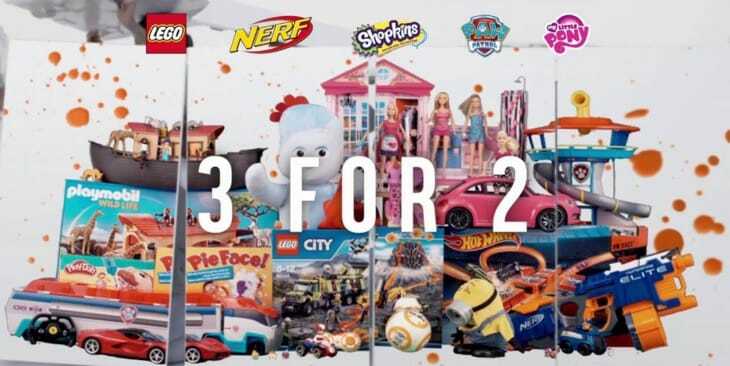 When is the next Argos 3 for 2 On Toys Event in 2019? Any updates or information that’s been leaked this April will be posted from readers and our insiders, revealing the exact dates on when Argos will have their 3 for 2 on toys later this year. Where to find the 3 for 2 on Toys – When this event goes live, you’ll be able to access all of the discounted items on this Argos page. Whilst you’re waiting why not visit their current sale for all the latest everyday deals this April. If anything changes we’ll let you know in the comment section below. Anyone know if the next Argos 3 for 2 on toys will be happening soon, or at least will it be in the first half of 2017? I’m not sure how many of these they hold each year. I really hope this sale is this side on July as its my sons birthday in August, fingers crossed. Once I get some more money in the bank after spending so much at Xmas, this is the sale I want. Love the 3 for 2 on toys offer at both Argos and Tesco. waiting for the next argos toy sale, does anyone have dates please?? need another peppa pig sale, come on Argos tesco has already started their sale! it should have been around 21st july if they do. surely they will do something else if not? Big news guys! Argos 3 for 2 Toy Sale starts again on Friday July 28! This event is extremely popular, so make sure you buy early before stock runs out! Any dates on when the next 3 for 2 is yet? Hi Trish. The last sale has just ended so you will have to wait a while now for the next sale. We will let you know here though as soon as we know. What are you after? It’ll be the last week in September thats how its been for a few years now..
normally ends the Monday or Tues the week after it starts. so first week in oct this isn’t for sure thou am just going off the last few years. Hi all, does anyone know how the multi buys work (such as 2 for Â£15) during the 3 for 2 deal. Argos 3 for 2 on toys starts tomorrow! till the 3rd of oct .. Missed the September 3 for 2 sale. Is there another before Christmas? Hi everyone. We are happy to confirm that the next Argos 3 for 2 Toy Sale will start on Friday November 3! Argos say that thousands of toys will be included in the event, so look out for the purple badge and start saving! Hey everyone, just so everyone is aware it looks like the next Argos 3 for 2 Toy Sale in July will happen on Friday July 27. Make sure you share this info with friends and family! Update: It has now been CONFIRMED 100% that the next Argos 3 for 2 Sale starts tomorrow, on August 3. The Toy Sale is now live at Argos! 1000s of toys to choose from across multiple ranges, let us know what you find. Hello everyone, we can confirm that the next 3 for 2 Toy Sale at Argos starts tomorrow! It will be available until October 2, over a thousand toys to choose from. Don’t miss it! Does anyone know if there will be another 3 for 2 event before Christmas? Thanks. Hi, is there going to be another 3 for 2 event before Christmas? If i remember right, the last 3 for 2 on toys was in last November. I’m hoping there is going to be another one in February 2019, does anyone know when the first sale of the year?